The most fun you can have on four wheels. KartWheelz kids go karting parties, throughout London and Greater London. 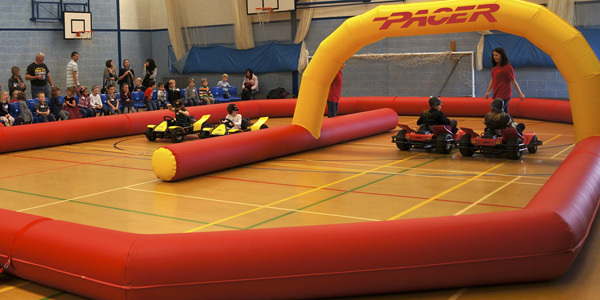 We are the Premier provider’s of Fun, Fantastic and Thrilling Go-Karting activities designed for Children’s Birthday Parties, Leisure Pursuits and General Amusements. We are totally mobile and can operate on any type of flat surface from grass to shopping centres as long as there is sufficient space to setup the track. Better still you can book one of our pre-organised venues near you. Safety – We have the latest Panther go-karts in the industry, with remote wireless power controller in the hands of the race instructor. Our bouncy safety barrier will stop anything that drives into it. Security – All our staff hold current DBS certificates and are qualified First Aiders. Clean power – Our fleet of go-karts use the latest batteries, and electric motors to ensure we have a green footprint for indoor or outdoor use. Fun party – Our race instructors want you to have the best party in town. We’ll organise full driver training, racing heats, race-offs, endurance and a lap-of-honour for a KartWheelz championship final when everyone can get a prize. Booking is easy, just contact Ollie our KartWheelz party organiser by phone 07918 655005 or email or see our book now page.